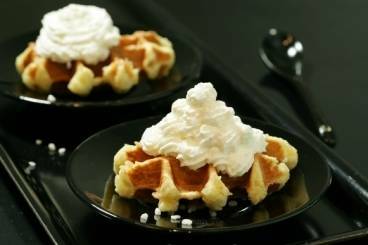 Waffles from the Liege region of Belgium served with Chantilly cream. Warm the milk and then mix in the yeast and the spice mixture. Cut the butter into small dice and leave to soften to room temperature. Place the flour, egg yolks, salt and the milk mixture in the bowl of a food processor and mix together. Cover with a warm cloth and leave to stand at room temperature for 30 minutes. Add the butter and sugar to the mixture and mix together. Preheat the waffle machine. Roll the waffle mixture into balls and then cook on the waffle machine until golden brown. Keep warm so that they do become soggy. Mix together the icing sugar and the cream. Place in a siphon, seal and shake before charging with the gas canister.